models suggest it will in the next 50, 60, 70 years, that life history becomes difficult and maybe untenable." LEWISTON, IDAHO Idaho's vertical geography may give salmon, steelhead and other native fish a fighting chance as climate change continues to alter their habitat for the worse. 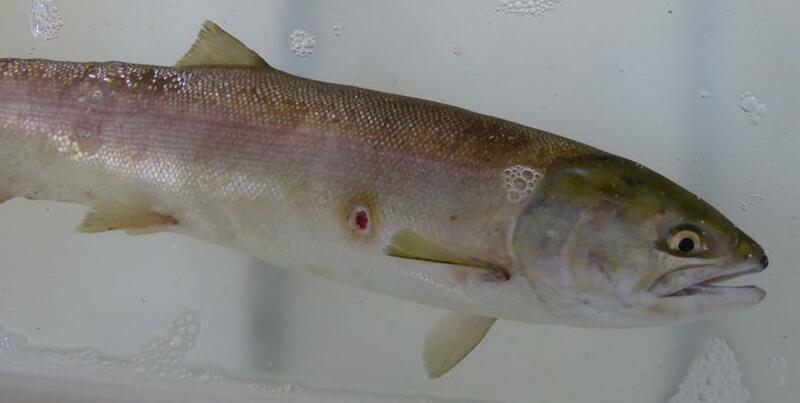 Scientists say resident fish such as cutthroat trout and to a lesser degree bull trout will still have plenty of clean, cool water in the Gem State. The mountain spawning grounds of anadromous fish like salmon and steelhead will still be productive. But the powerful sea-run fish will face uncertain conditions in the ocean and find it even more difficult to negotiate the heavily altered habitat in the Snake and Columbia rivers. Most climate models show future Idaho receiving about the same or slightly more precipitation than it does now. With rising air temperatures, modeling predicts more of that moisture will fall as rain instead of snow. Spring floods that flush juvenile salmon and steelhead to the ocean and help them pass dams on the Snake and Columbia rivers will likely arrive earlier and be shorter in duration and volume. Mountain streams that depend on melting snow to feed them throughout the summer will see lower flows and higher temperatures. That effect will cascade downstream where mainstem rivers will also see lower flows and higher temperatures. Climate scientists are less certain about what will happen in the ocean. But they say there could be less of the upwelling that helps seed the upper layers with nutrients that feed the base of the food chain. The ocean also is expected to become more acidic, a problem for many lower-food-chain species. To get an idea of what the climate might be like for salmon, steelhead and trout, look no further than last summer. The entire Pacific Northwest saw meager snowfall, much-reduced runoff and high summer stream temperatures. Sockeye salmon were hit the hardest. Returning adults faced unprecedented high water temperatures and the run melted away as the fish stalled or perished in the Snake and Columbia rivers. "Redfish Lake sockeye are probably the most at risk," said Lisa Crozier, a research ecologist for the National Oceanic and Atmospheric Administration's Northwest Science Center in Seattle. "They are in the river at the worst time of year." Ocean conditions were poor, which led to weak returns of fish like coho salmon. "I think this summer in many ways was a climate change stress test on Northwest salmon habitat," said Nate Mantua, climate and fisheries scientist for the National Oceanic and Atmospheric Administration in Santa Cruz, Calif. "You could see which runs were especially vulnerable to a situation with much higher temperatures, much reduced snow pack in our mountains and about average precipitation for Northwest watersheds." But Dan Isaak, a U.S. Forest Service fisheries biologist at Boise, said Idaho's salmon and trout may be better off than those in other Northwest states. Because Idaho is steep, ranging in elevation from 750 feet at the mouth of the Clearwater River in Lewiston to more that 12,600 feet at the top of Mount Borah in the Lost River Range, there is great hope that even if climate change shrinks the range of some native fish that enough cold water habitat will remain for the species to be viable. "We are a really steep state, which creates a strong temperature gradient," he said. "So as things warm up the temperature isotherm doesn't shift nearly as far as it does in a flat place. That has a really dominating effect on how much the thermal habitat is going to shift." In many cases, Isaak said cold water fish species may be able to simply move upstream, sometimes as little as a few kilometers. Fish that live in places where the habitat is on the verge of being too warm will be in trouble. But high mountain streams that are too cold today to promote adequate fish growth might become ideal in the future. For example, there are places where it is simply too frigid for cutthroat trout to thrive. "They are going to gain (habitat) at about the same rate on the top end as they are going to lose it at the bottom end." Bull trout also will likely find enough cold water to persist in Idaho, Isaak said. But they are likely to suffer more than cutthroat. The trout that is actually a char occur at low densities and need large expanses of cold water. They are not limited by frigid temperatures at the highest elevations. So as streams warm from the bottom up, bull trout habitat will be squeezed. "Wherever it's warming up, they are gradually losing habitat," Isaak said. The big problem for salmon and steelhead won't be the habitat where the adults spawn and the juveniles hatch and rear before going to the ocean. The pinch point will likely be the migration corridor when adults and juveniles will be forced to deal with less and warmer water in the dam-altered Snake and Columbia rivers. If the unprecedented conditions of last summer become more common by the middle of the century, Mantua said some species of salmon and steelhead will be hard-pressed to adjust. "Some salmon have evolved a calendar that has worked for many centuries. But if the climate changes the way models suggest it will in the next 50, 60, 70 years, that life history becomes difficult and maybe untenable." Mantua said salmon have displayed great adaptive capacity over thousands of years, and given a chance that ability will help them deal with climate change. "If we can build what people talk about -- resilience -- just by providing more and more options for them on the fresh water and estuary side, I think that gives them a lot of hope for dealing with a future with a lot of change because that is what they have always done."